The 49ers and the Texans entered this season as two of the most interesting teams in the NFL. They were uncertainties; no one knew what to expect from a full year of young guns Jimmy Garoppolo and Deshaun Watson. We know what happened to San Francisco and Garoppolo so their struggles get a bit of a pass. Houston, on the other hand, have been underwhelming in an oddly innocuous way — they’ve evened out at a pedestrian 2-3 record after an 0-3 start, and they’ve been somewhere in between Watson’s electric five-week 2017 run and the 1-8 record they choked up after Watson’s torn ACL. Two early season losses, to the Titans and Giants, skew opinions of a team that was projected by some to bust out of the gates early. A 27-20 Week 1 loss to New England was less competitive than the score indicates (it was 21-6 at halftime), and Houston have been middle of the pack on both offense and defense. Watson, for his part, has done what reasonably can be expected of him. He’s thrown for 1,621 yards, sixth-most in the pass-happy NFL, and his 2.6 percent interception rate would be top 10 in the NFL if not for two picks that were not his fault — a desperation heave amid heavy pressure with 20 seconds left against Dallas, and a pass that was ripped out of DeAndre Hopkins’ hands in Indianapolis. But a dreadful offensive line holds Houston back. Watson rarely has time to throw, and when he does, he has to manufacture it with clever pocket maneuvering. Houston doesn’t have a running game; Watson’s 201 rushing yards on 5.9 yards per attempt rank second on the team behind the ineffective Lamar Miller, who has 225 rushing yards on 3.9 yards per carry. They’ve managed just two rushing touchdowns, one of which was a designed Watson carry against the Giants. 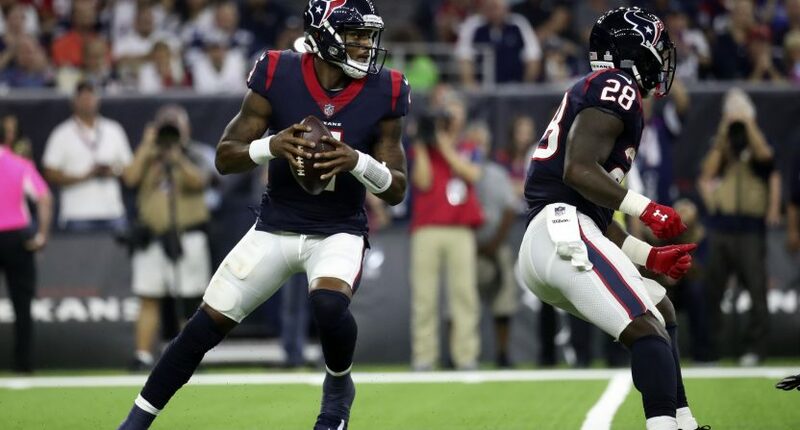 Coach Bill O’Brien seems resigned to their run game being mostly constricted to Watson; their passing attempts have increased every week, despite playing from behind more often early in the season. There is value in Watson shouldering much of the load in the run game. He forces opposing blitzes to tone down their aggressiveness for fear of Watson scrambling. Run-pass options (and the occasional traditional option play) are naturally more effective. Teams have to designate QB spies for nearly every play, creating mismatches for running backs and slot receivers. Dallas leaned on a Cover 1 defense (man-to-man with one deep safety) on Sunday Night Football. Jaylon Smith was the lone zone defender, besides the safety, on the above play, and the design for the Texans was always to check it down to Blue and force Smith to tackle him in open space. The Cowboys’ defense played well overall, generating pressure on Watson and holding Houston to 19 points. Watson managed 375 yards and a season-high 75 percent completion percentage and still failed to score 20 points. Involving DeAndre Hopkins has not been a problem. Hopkins has been targeted 57 times and gained nearly 600 yards. That he’s only caught 39 of his targets is more of an issue — his 68 percent catch percentage is approaching Antonio Brown-Ben Roethlisberger levels of inefficiency. given little advantages. Besides Will Fuller V, the Texans are short on dynamic receivers that can compensate. Watson, for his part, has a tendency to bail on the pocket too early. He’s become almost conditioned that pressure will arrive early, so when it doesn’t come — or even if there’s a hint of it on the edge — Watson is likely to duck away and go solo. Open receivers can go unseen when he is too busy running from scrambled pass-rushers to get his head up, or when he can’t get his feet set in time to throw effectively. Faulting Watson for the Texans’ offensive lethargicness is difficult, though. O’Brien’s leash has to be getting shorter. Given how important it is for NFL teams to win while their QB is on his cheaper rookie contract, Houston can’t afford to be wasting Watson’s good years — especially with an injury-ravaged JJ Watt approaching 30. The AFC South is forgiving, with the Titans mired in weekly low-scoring dogfights and Blake Bortles alternating between Bad Blake and Good Blake, with Bad Blake showing out more often. Houston may not have to win 10 games to make the playoffs. There’s no doubt, though, that the Texans are underperforming, and throwing away their first competent quarterbacking performances since the earlier days of Matt Schaub.